The 1950s brought about a paradigm shift in Tamil theatre. It was the decade that saw the emergence of social themes being portrayed on stage, marking a change from the earlier eras where mythological and historical themes dominated the content. A key contributor to this change was S.V.Sahasranamam, the subject of this piece. 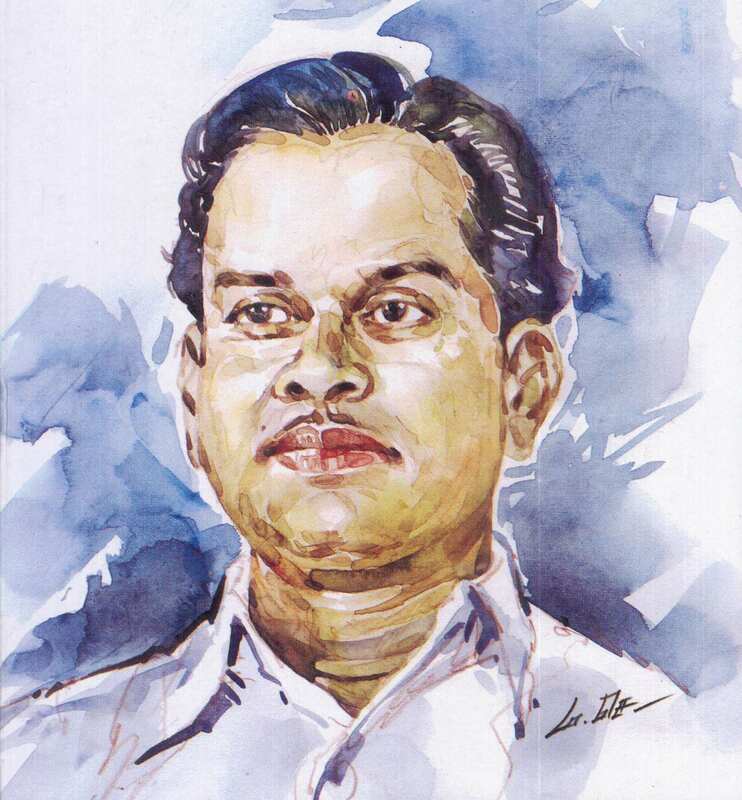 S.V.Sahasranamam was born in Singanallur, near Coimbatore on 29th of November 1913. His father Venkatramana Iyer was a Government servant employed in the Irrigation Department at a salary of Rs.5 per month. The family was of modest means, with the salary of the father being the only source of income. When Sahasranamam was six years of age, a massive plague affected the entire district and many families vacated the place. Sahasranamam’s parents however stayed back to undertake relief work, while he and his siblings were sent to live with their maternal uncle. Unfortunately for them, their mother was one of the many victims claimed by the plague. Following the death of his mother, he was sent to Pollachi to be brought up by his father’s elder brother’s family. While in school, he developed an interest in theatre and acted in small roles in school plays. One day, he happened to watch a performance of “Abhimanyu Sundari”, by the Madurai Sri Balashanmukhananda Sabha, a Boys Company which in its later avatar became the T.K.S.Nataka Sabha. Captivated by the performance of T.K.Shanmugam as Abhimanyu, Sahasranamam decided to join the troupe. He followed it to Coimbatore from Pollachi, his travel expenses being met by the sale proceeds of his new English text book! Sahasranamam was required by the manager of the Balashanmukhananda Sabha to produce a letter from his father to the effect that he had no objection to his son joining the troupe. This posed a problem for Sahasranamam, whose journey had been without the knowledge of his family. However, in his keenness to join the troupe, he created a consent letter and forged his father’s signature on it. He was duly admitted into the troupe. His joy was however short lived, as the manager of the troupe suspecting foul play brought Venkatramana Iyer to the camp the very next day. Confronted by his father as to whether he wanted to continue studying or take to acting, Sahasranamam replied that he wanted to be an actor. Venkatramana Iyer had no choice but to agree. The Boys Company essentially followed the Gurukula System, where besides learning various components of acting, the students also learnt to carry out routine administrative works related to the functioning of the troupe. Sahasranamam was a quick learner and the rigorous training he underwent held him in good stead as an administrator when he later started Seva Stage. It was also here that he forged a friendship with Kalaivanar N.S.Krishnan, a fellow actor in the troupe. It was a relationship that developed into a strong bond, with Sahasranamam in later years becoming his manager. Sahasranamam’s film debut came about with Menaka. A famous novel written by Vaduvur Doraiswamy Iyengar, it had been made into a successful stage play by the Balashanmukhananda Sabha. A production house named Shanmugananada Talkies which had been formed by a group of businessmen from Coimbatore decided to make it into a movie, with the entire cast of the stage play being roped into the movie as actors. Sahasranamam, who had donned a role in the play travelled along with the entire troupe to Bombay, where the film was shot. Sahasranamam quit the Balashanmukhananda Sabha in 1936 on account of a misunderstanding with the managers. After stints as a manager with a couple of film houses, he joined N.S.Krishnan as a manager in his production house Ashoka Films. More than an administrative manager looking after the production activities, he became N.S.Krishnan and T.A.Mathuram’s trusted lieutenant, managing their schedules and at times even driving them to various locations. Such was the confidence the pair had in Sahasranamam’s abilities that the responsibility of running their drama troupe N.S.K Nataka Sabha was thrust on him during the time N.S.Krishnan was in jail in connection with the Lakshmikanthan murder case. His long standing desire of establishing his own troupe bore fruit when he formed Seva Stage in 1953. The troupe ushered in a new era of experimental theatre, with social themes being its focus. The first play staged by the troupe was “Kangal”, which was the Tamil adaptation of Rabindranath Tagore’s short story Vision. The play was a resounding success, with the main roles being donned by Sivaji Ganesan, Pandari Bai and her sister Mynavathi. The success of this play was followed by yet another experimental venture, Irulum Oliyum, which featured just four actors and four scenes. Vaanavil, an adaptation of Temporal Power, a novel by the famed British novelist Marie Corelli provided the audience with the unique experience of a revolving stage, which was a first for Tamil theatre. The technical aspects of these plays, especially the sets were taken care of by Kalasagaram Rajagopal, the famous sculptor. Yet another first brought about by Sahasranamam was the establishment of a drama school in 1957 to teach various aspects of theatre to aspiring artistes. The school was inaugurated in a function at the R.R.Sabha, Mylapore by C.Subramaniam, with various dignitaries such as Rukmini Devi Arundale participating. The first batch comprised of 26 students. Noted personalities such as Khi.Va.Jagannathan, S.D.Subramania Yogi and T.K.Shanmugam visited the school to teach them. Amongst the batch of 26 students was Komal Swaminathan, who later became one of Tamil stage’s most powerful playwrights. Productions such as Policekaran Magal, Naalu Veli Nilam, President Panchatcharam and Therotti Magan ensured Seva Stage’s continued success on the theatre scene. Sahasranamam managed get noted writers such as T.Janakiraman, Ku.Alagiriswami and B.S.Ramiah to script these plays. With an array of noted film personalities such as Muthuraman, Devika, S.N.Lakshmi and Pandari Bai to name a few acting in them, these plays did not lack star value either. Many of them such as Policekaran Magal were also later made into movies, with Sahasranamam reprising his stage roles on screen. Panchali Sabatham, a stage adaptation of Subramania Bharati’s immortal poem was yet another production that won many accolades for being a pioneering attempt. This play was also staged in Calcutta during the Rabindranath Tagore Centenary Celebrations as a part of the performances by the delegation from Tamil Nadu. He was a part of the Indian cultural delegation that visited the Soviet Union in 1960. For his contribution to the field of theatre, he was awarded the prestigious Sangeet Natak Academy award in 1967. Sahasranamam suffered five heart attacks between 1974 and 1988. He was in the midst of producing a new play, “Nandha Vilakku” when he suffered his final heart attack. He passed away on February 19th, 1988. Sahasranamam’s birth centenary was celebrated recently, with his protégé Kalaimamani P.R.Dorai and son S.V.S.Kumar organising a yearlong celebration.